Making a math pond was a simple project that has become one of my son's favorite activities. I used the vast resources of the internet to find simple drawings I liked and then edited them on photoshop to print out these ponds on blue paper. 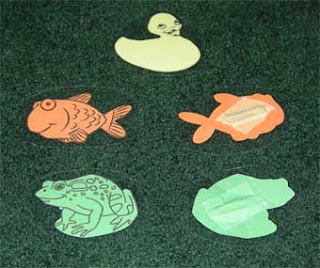 I then found free coloring pictures for the ducks, the fishes, and the frogs, and printed them on colored paper. For the fishes and frogs, I trimmed construction paper to make it fit in our printer. This is so much cheaper and easier than printing in color. Out in the farmer’s pond one day. That he called for another yellow duck to come. Four little ducks came-a-waddling back. But when old mother duck said "quack, quack, quack"
No little ducks came-a-waddling back. But when old father duck said "QUACK, QUACK, QUACK!" Five little ducks came-a-waddling back. The next week we were learning about orange, so I made orange fishes to add to our math pond game. Elsewhere on this site I have mentioned that I love my laminator, which I have made several bits of intelligence cards with. It is also perfect for projects like this, as having laminated fish is better for the endurance of this toy, especially if it is used often. You could also use clear contact paper, or even clear boxing tape and have similar durability. I cut the fishes out, laminated them, then cut them out again to create a water-proof seal, which has really turned out to be handy a couple of times. Then I taped paper-clips to the back for some real fishing. My fishing pole was made with an oak dowel I bought at home depot. (I had bought it to help Helen grasp it as part of the "physically superb" program, but it wasn’t very practical for me and I never used it. The fishing pole has been a much better use!) I taped a piece of ribbon to the pole, and then used a lot of tape to safely secure a strong magnet to the other end. Voila! A fishing pole. I will set up the ponds with the corresponding number of fish (I only did different animals in this picture for illustration purposes, I only do one animal at a time) and let the consistent set-up of the numbers do the teaching. With my son, I just focus on having fun. Making it a "joyous" activity. I am sure I could have found cute songs or rhymes for the fishing pond, but Peter loves it as it is, so I let myself off easy this time. See, there is one speckled frog. 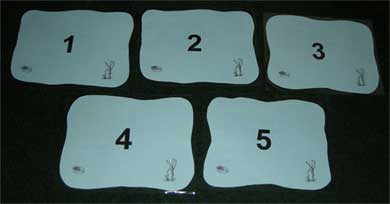 Here is a website with more Math Pond Activities.